To have mental states (like seeing red), you need a soul. It's the soul that sees red. Ava, in Ex Machina, couldn't have mental states unless she has a soul. 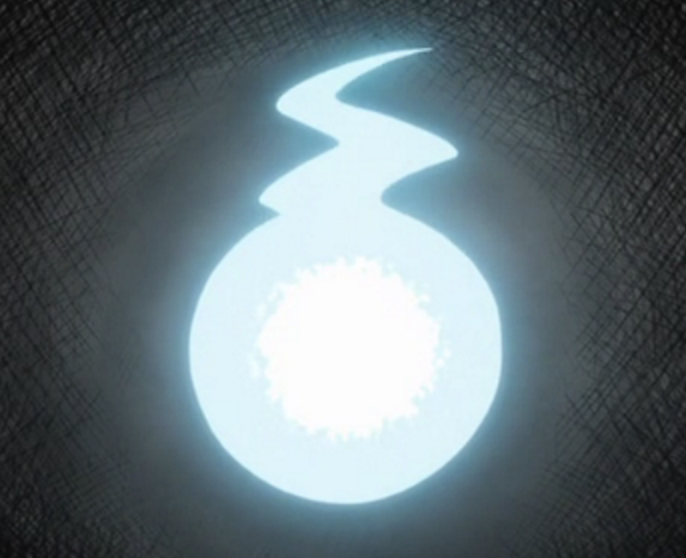 Also known as the Mind/Brain Identity Theory or simply the Identity Theory. To have mental states (like seeing red), you must have a brain, and don't need a soul. It's the brain itself that sees red. 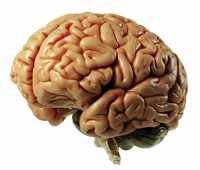 Mental states are identical to brain states. The biological science of the brain will eventually explain each and every type of mental state. We will understand that feeling hot is this particular brain state, seeing red is that brain state, etc. Ava, in Ex Machina, doesn't have a biological brain, so couldn't have mental states. To have mental states, you don't need a soul. 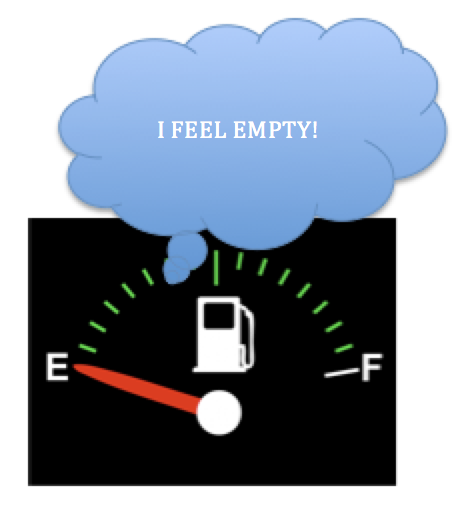 Mental states are functional states, likes being an alarm is a functional state. Any system can have mental states if it functions in the right way. The science that explains mental states will be computer science, not brain science. 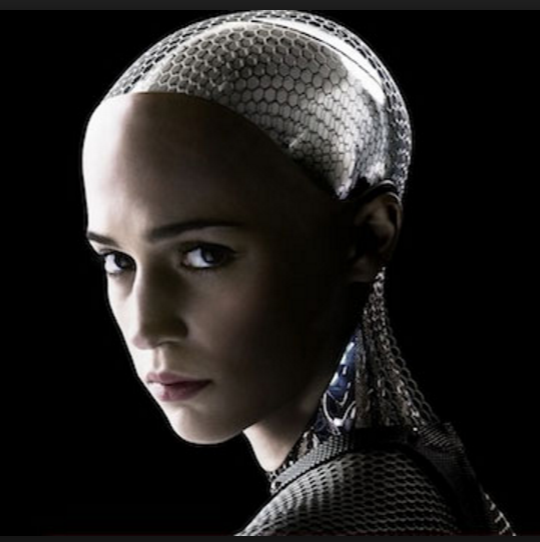 An AI like Ava in Ex Machina, could (in principle) function so as to have mental states. 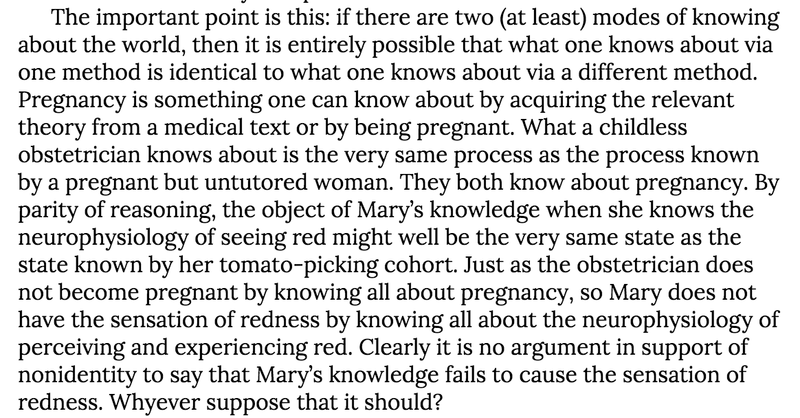 Why this is called "naturalistic dualism"
Churchland's argument: pregnancy gives the obstetrician a new window onto the same old thing--pregnancy. Likewise, leaving the black and white room gives Mary a new window onto color vision. However, she doesn't discover any new, non-physical feature of color vision. Using the typology below, which type of response is this? 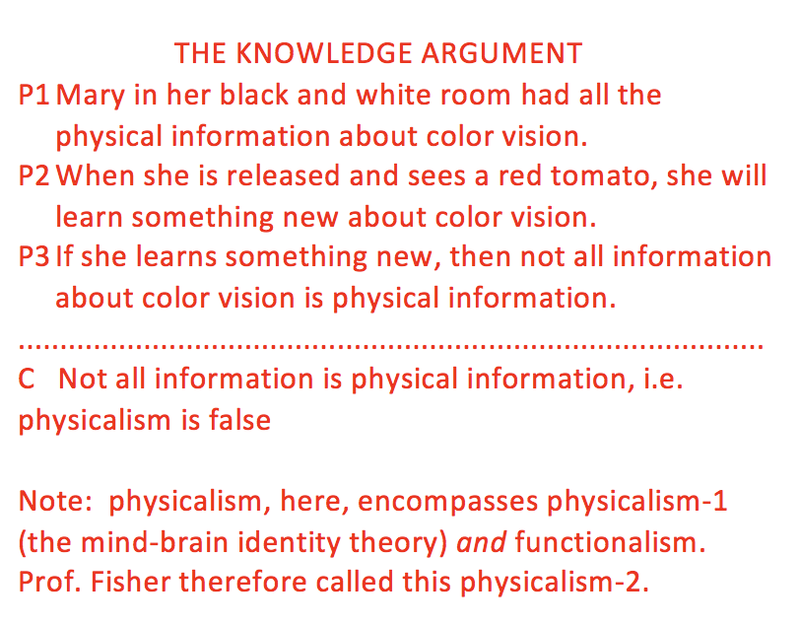 Type A physicalists (like Dennett, mentioned in the Chalmers video) deny P2, and hold that Mary's textbook knowledge about color vision actually would put her in position to fully anticipate what would happen in the tomato scenario, so she wouldn't be surprised at all. If you think she would be surprised, then Dennett thinks you probably haven't really imagined what it would be like to know *all* the physical info about color vision. Type B physicalists deny P3, holding that whatever it is that Mary gains, it isn't completely new information about color vision. 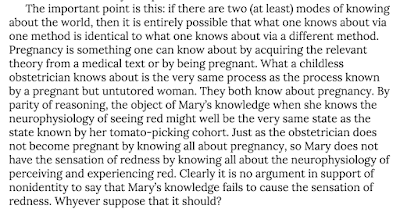 E.g., David Lewis thinks that all Mary gains is the *ability* to recognize red when she sees it again as the same color as she saw on the tomato. Paul Churchland thinks that Mary gains info in a new part of her brain -- the visual cortex -- info which was already present in a different part of her brain -- the part which held textbook knowledge. Since this isn't completely new info, it is no counterexample to physicalism. These Type B physicalists think we have two different windows onto the physical events happening in our brains: one window involves learning about our brains using third-person science; the other provides an introspective window upon the same brain events. The fact that Mary can add info to her list of things she's seen through the second window does not in any way show that her view through the first window wasn't complete. Type C reply is Mysterianism (advocated by Colin McGinn). This view basically denies P1, and says that our minds are incapable of fully understanding conscious experience. We evolved to solve certain sorts of problems that our ancestors faced, but fully understanding our brains and consciousness would involve far more brainpower than that, so we're simply incapable of doing it. Kind of like it would be completely hopeless to for your dog to try to understand algebra, McGinn thinks it's completely hopeless for humans to try to understand consciousness. This view may turn out to be right, but it's premature to give up hope at this early point. Our ancestors also had no need to understand rocket ships or relativity, but we still managed to wrap our heads around those things. Maybe we'll be able to wrap our heads around consciousness too. Tangent. I mentioned that, on McGinn's view, perhaps our best hope of understanding this stuff would be to build AI's that surpass our own cognitive limitations. This led students to ask questions about (i) whether the relevant computational power is possible, (ii) about whether such a computer would have a mind, (iii) about whether we could transfer our own minds into a computer, and (iv) about whether the resulting computer would be *me* or just something with a mind a lot like mine. I noted how question (iv) is very similar to questions that come up in the personal identity over time literature, e.g., in cases of tele-transportation. Type D response is interactive dualism (advocated by Descartes, for example). If minds involve non-physical stuff or properties, then this would explain why there is more info for Mary to learn about color vision, beyond the physical info. However, David Lewis pointed out, dualism doesn't really help. We could imagine Mary also reading textbooks about dual substances and how they interact with physical substances. Still, the intuitions are just as strong that, until she sees red for herself, she won't know what it's like to see red. Type E response is "epiphenomenalism" which is dualism with the interaction going only in one direction, body to mind. This was the conclusion Jackson drew from the Mary argument. Jackson thought that the Mary argument showed that there is something non-physical, and he was confident that conscious events (like pain) were caused by physical events (like getting hit with a hammer). However, since physicists couldn't find any evidence of any physical events being caused in weird ways, Jackson concluded that the interaction didn't go in the other direction. This means that whatever behavior people produce (including every single claim they utter about consciousness), this is produced by their *brains*, not by their separate conscious minds. It's a lucky coincidence that the same time as our minds decide to do things, our brains also just happen to send out the right motor commands to do them. Type F response is Chalmers own preferred view, "pan-psychism", which holds that even the most basic physical elements have, as part of their nature, some limited form of consciousness, and that these limited forms of consciousness can lead to higher forms of consciousness when physical elements get arranged into brains. Mary's black-and-white education would leave out these conscious aspects of the basic physical elements, so that's why there's more info for her to gain when she sees her first tomato. 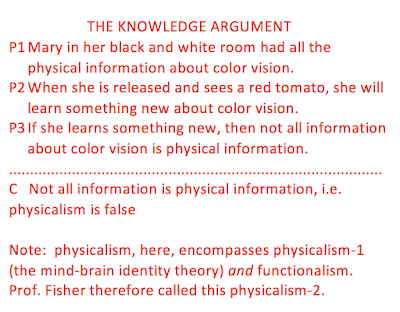 The Jackson-style argument that Lewis used against dualism (imagine Mary learns all about dual substances in her room -- that still wouldn't tell her what red would look like) arguably doesn't work against pan-psychism -- if Mary were to learn all about the conscious aspects of physical stuff, and how these combine to form higher forms of cons, this really would tell her what it feels like to see red. However, this view is faced with many of the same problems as the two dualisms, explaining how these psychic properties interact with ordinary physical properties and why they seem to interact if they don't, and explaining why we should believe in all these weird properties without any physical evidence of their existence.